Ok, I’m not rubbing it in but for the purposes of this post I have to begin with…it was a beautiful, sunny, hot day at Georgetown with light breezes passing through. Truly that is necessary information because on this day we played in the water and even I enjoyed wading, swimming, and splashing without ever muttering, “oh it’s cold.” It was lovely! 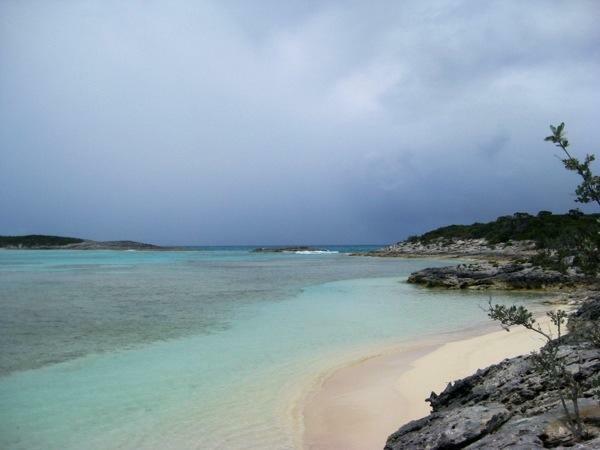 After breakfast we hailed Por Dos to invite them to join us for snorkeling and kite flying. 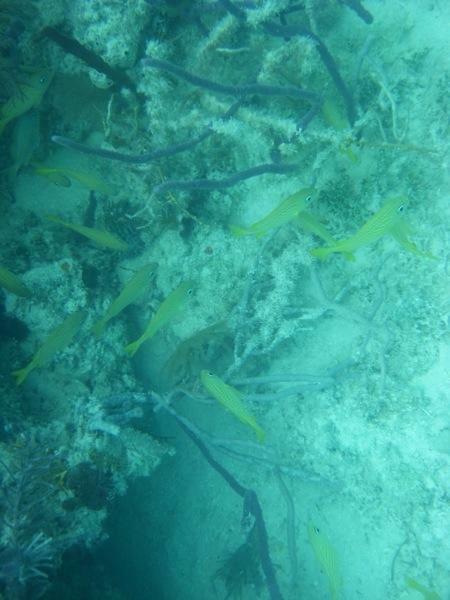 There were a few areas of coral near Elizabeth Island that we thought might be worth exploring. Mark, Roan, Andrew, and Will came along. 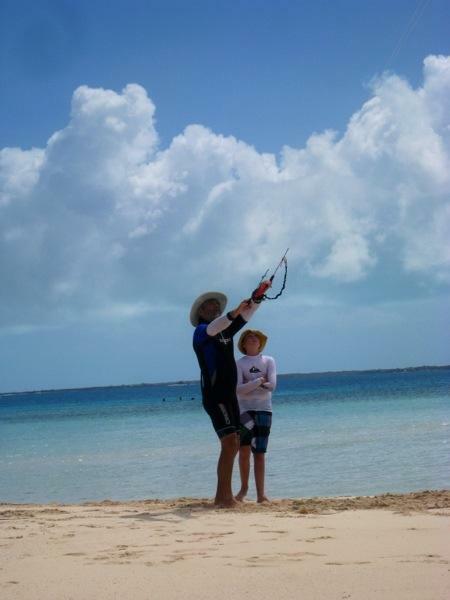 Out near the coral we anchored the dinghies and put on our snorkel gear to hop into the water. 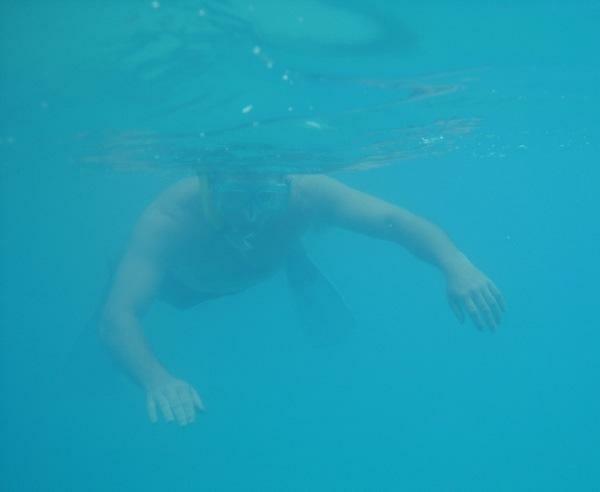 The visibility was poor, but that didn’t stop us from swimming around several patches of coral. Here’s a pic of Brian snorkeling. I did pass along the camera to him, but he was too easily distracted by fishes to take a picture of his beautiful, brave wife snorkeling. 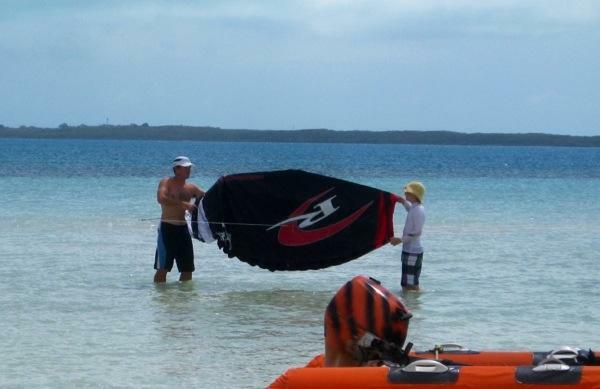 This time I did wear the swim fins and strayed quite a distance from the dinghy. I got a bit more comfortable just floating. (After a trial, Brian confirmed that I’m not being a total wimp and that my $11 Target red light special fins are terrible and we’ll be on the lookout for an upgrade). Next over to the beach where we found sand bars as the tide was just beginning to rise. There was a cut to the ocean here, which Brian and Mark ventured out later in the day to get in a successful round of spear fishing. 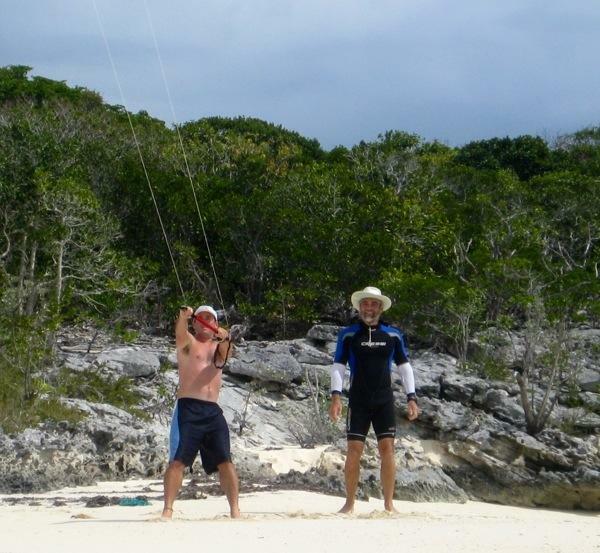 Brian, Mark, Roan, and I took turns flying our trainer kite boarding kite. The wind was a bit shifty; it soon became a game of catching the kite before it fell into the water. Launching, flying, and catching were equally fun. Our lunch break was still action packed. 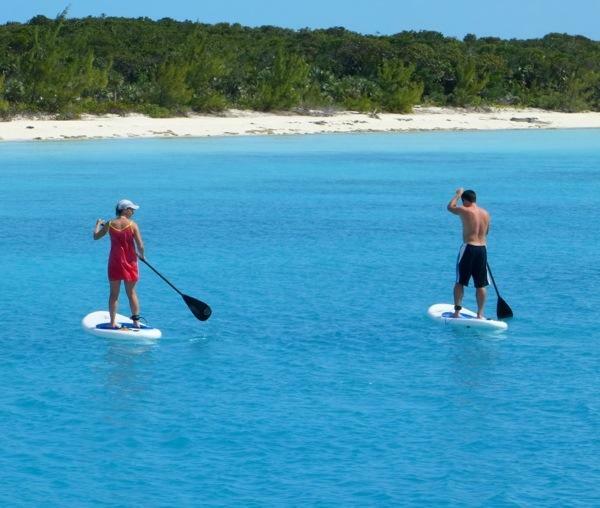 In-between lunching and snacking, the boys took out their sailing dinghy and Brian and I borrowed the paddle boards. Later that afternoon another snorkeling expedition with Marta and Sarah joining. 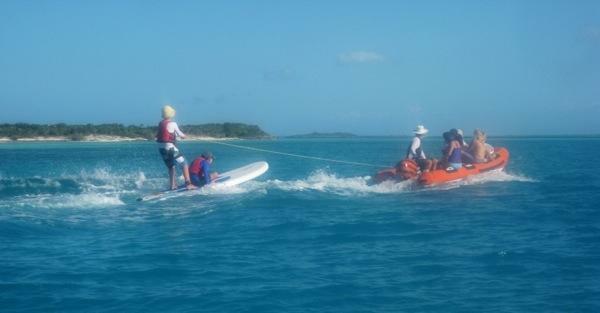 Roan, Andrew, and Will took turns paddle board-boarding behind the dinghy. All tuckered out that evening, Brian and I joined Por Dos for a tasty taco night. Brian cooked up the Schoolmaster Snapper and Blue Striped Grunt he and Mark had speared and we brought along a cabbage coleslaw to top the fish tacos. MMMMM…GOOD! 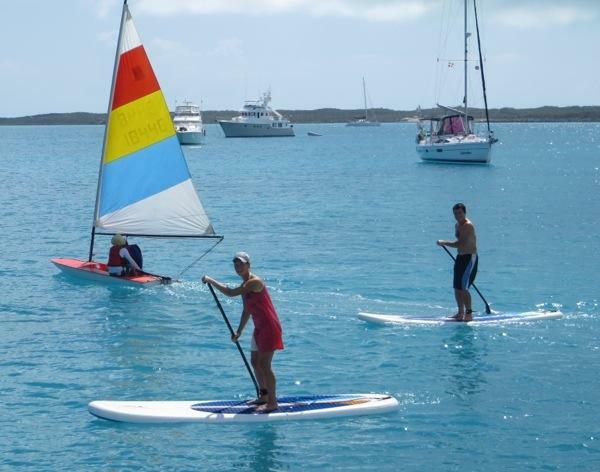 This entry was posted in Uncategorized and tagged bahamas, Georgetown, Great Exuma Island, kite boarding, paddle board by stephanie. Bookmark the permalink. Noticed from the photos..you all smart to keep covered up…the sun reflecting off the water can really cook you…failure to do so on my part has resulted in lots of skin cancer removal in my “Golden Years”…;On our last cruise in the Virgin Islands our pre charter manual suggested pajamas..They worked well keeping the sun off and were loose enough to be cool..Maybe you all have tried that, too. Okay, enjoy this…this morning there was a brief appearance of the sun….it has been cloudy and gray all day as well as quite chilly. Yes, do be careful about sun exposure ..it can come back to visit you in later years…. Your photos are fun and I feel like I am on an armchair vacation! Sounds like Brian could get a chef job any time! How about on a yacht? Happy Birthday, Brian! Have a great time while the ‘rents are in “town”. HAPPY BIRTHDAY, BRIAN. I THINK YOU SHOULD TAKE YOUR MOM TO A FANCY RESTAURNAT TO CELEBRATE. Hmmm…if it gets me an upgrade to a yacht, I think cooking day and night sounds great! We practically bathe in sunscreen each morning! Hats and sunglasses are part of our daily wardrobe as well. Trying to stay safe and keep cool. I’ll admit I don’t mind the additional color though!